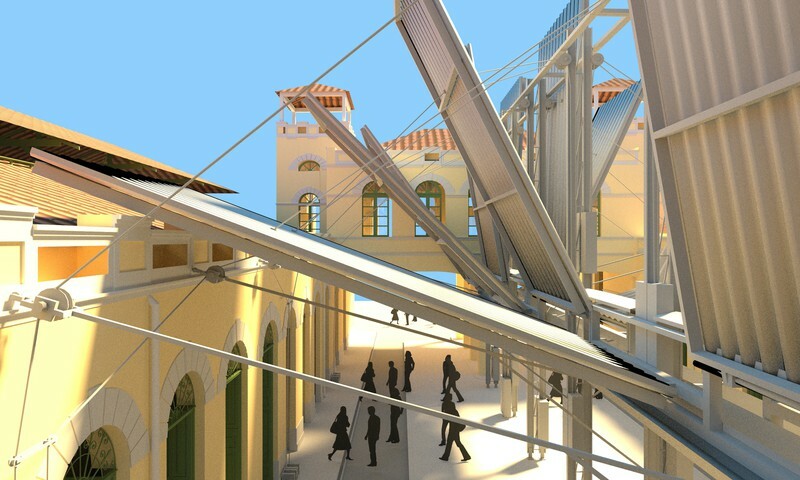 Our proposal is inspired by theater scenography, with a visual identity that is very different from the surrounding architecture, so it becomes unique and significant, and also achieves the reversibility and retractablility required by the project. 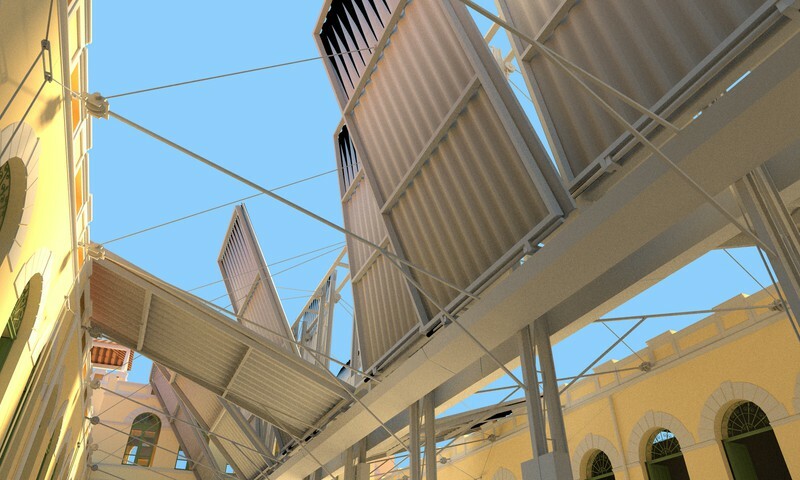 Composed by 30 mobile metallic panels (each one 4.30m by 8.15m) connected by a central metallic structure, it is thought as a decentralized roofing system, where each part can be moved manually, individually or in trios, by the market vendors. Each part can be activated by individual crank systems, and can be elevated at an angle between 25 to almost 90 degrees. Between these two, any position is possible, resulting in a rich diversity of combinations, light and shadow situations and ventilation behaviours. 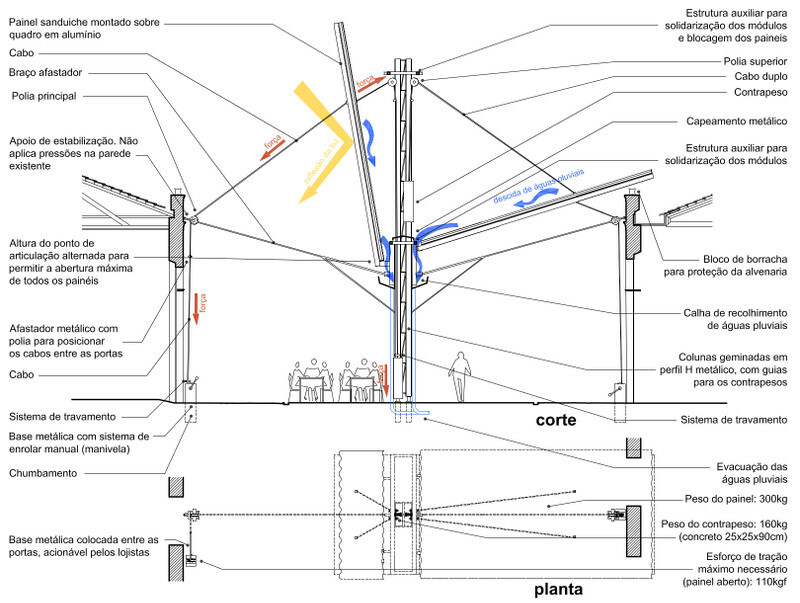 The manual operation is possible through a system of counterweights, placed in the central part of the structure, which allow a person of normal weight to operate it with relative facility. A pair of locks allows to fix each panel in a certain position and turn it resistant to winds. When all the 30 panels are down, they cover almost 100% of the central open area. Total water-tightness is not an objective of this proposal. 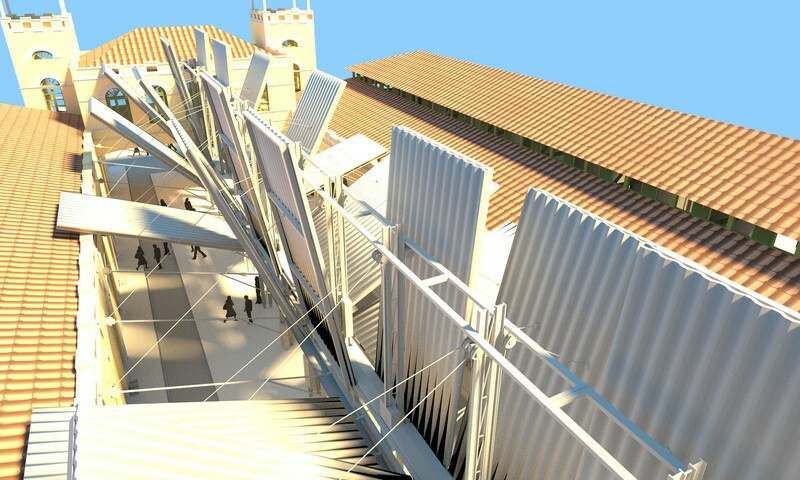 The draining of rainwater is made from the central part of the new structure, while the panels extend above the existing roof, without touching it. This way, while gathering its own water, the roof leaves small vertical openings at its border, between the panels, and between the roof and the accesses. 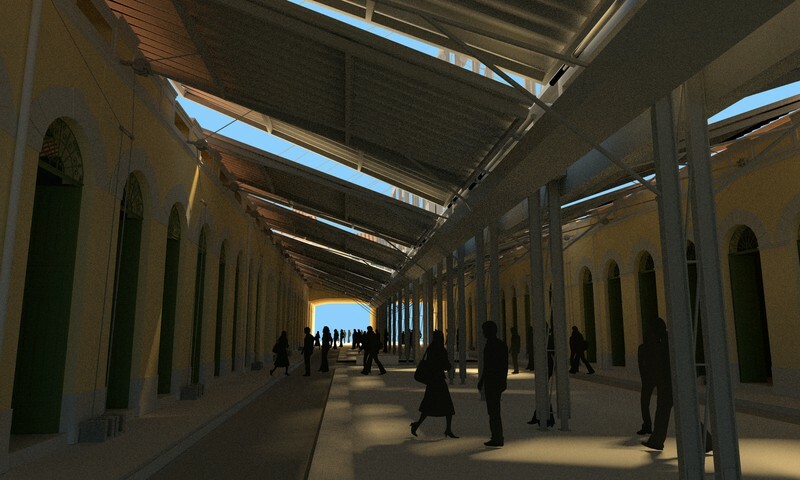 These openings allow a basic quantity of natural light to get through, even when the roof is fully closed. 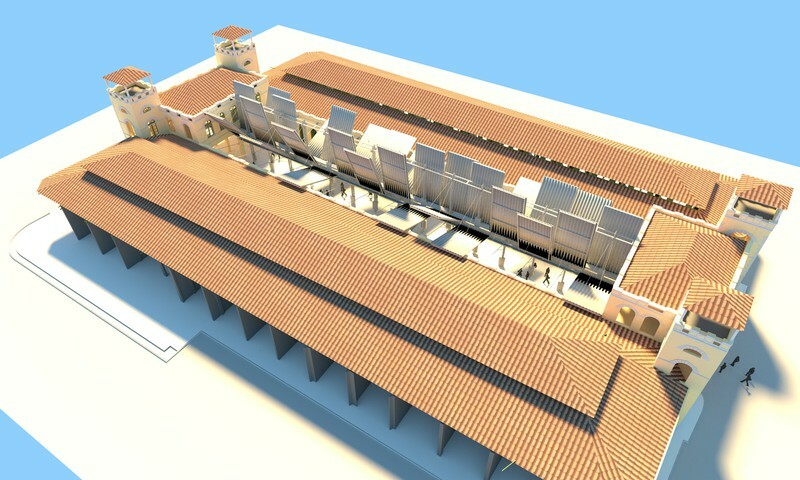 When fully open, the roof keeps the central space totally open in almost all of its area. To take advantage of the constant and random play of light and shadow that the metallic panels can provide, we decided not to use any transparent part. 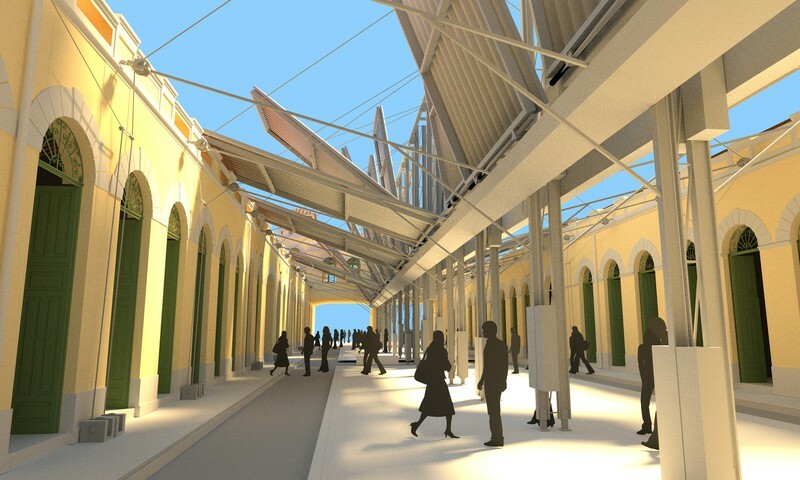 This way, with the movement of the panels, each market vendor becomes an active creator of the everyday variation of visual atmosphere that the new roof will provide on the public market. Full competition panels are available here, and the FreeCAD file here.